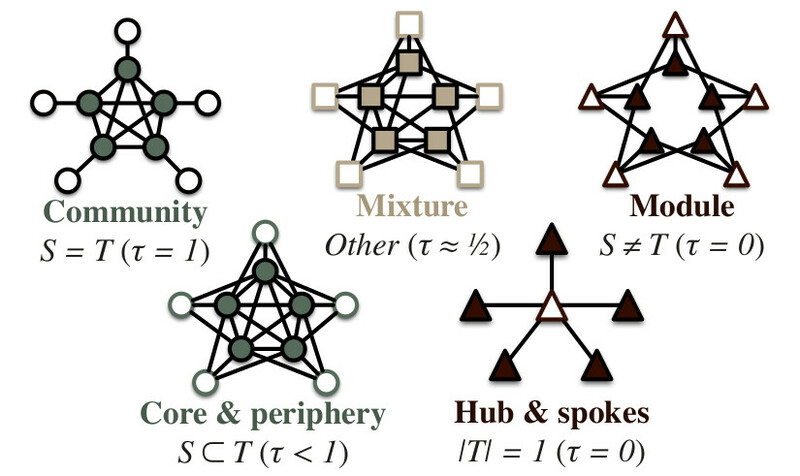 L. Šubelj, N. Blagus, and M. Bajec, “Group extraction for real-world networks: The case of communities, modules, and hubs and spokes,” in Proc. of NetSci ’13, 2013, p. 152. L. Šubelj, S. Žitnik, N. Blagus, and M. Bajec, “Node mixing and group structure of complex software networks,” Advs. Complex Syst., vol. 17, 2014. The adopted network node group extraction framework extracts groups from a simple undirected graph sequentially. An optimization method (currently random-restart hill climbing) is used to maximize the group criterion W(S,T) and extract group S with the corresponding linking pattern T. After extraction edges between S and T are removed and the whole process repeated on the largest weakly-connected component until the group criterion W is larger than expected on a Erdös-Rényi random graph. You will need to compile the source code to get a working tool. This should work on any platform using any standard C++ compiler (eg. GCC, Visual Studio), but it has only been extensively tested in the following environment. Executable file is located in ./src/nodegroups. If you encounter any bugs or have feature requests, please file them in the issue tracker, or even develop it yourself and submit a pull request on GitHub. This code is licensed under the GNU Affero General Public License 3.0+ (AGPL-3.0+). Note that it is mandatory to make all modifications and complete source code publicly available to any user.